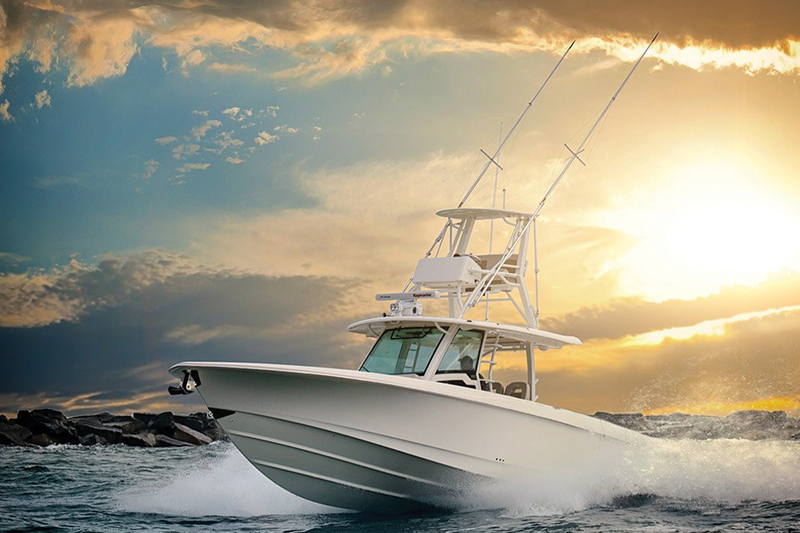 These 10 top center console boats will have you out at the fishing grounds and filling the cooler in no time. Center console boats are incredibly popular among anglers, but interestingly, they’ve recently become popular among the speed boat crowd as well as for a wide range of boating adventures. To anyone who’s owned a center console, that makes perfect sense. 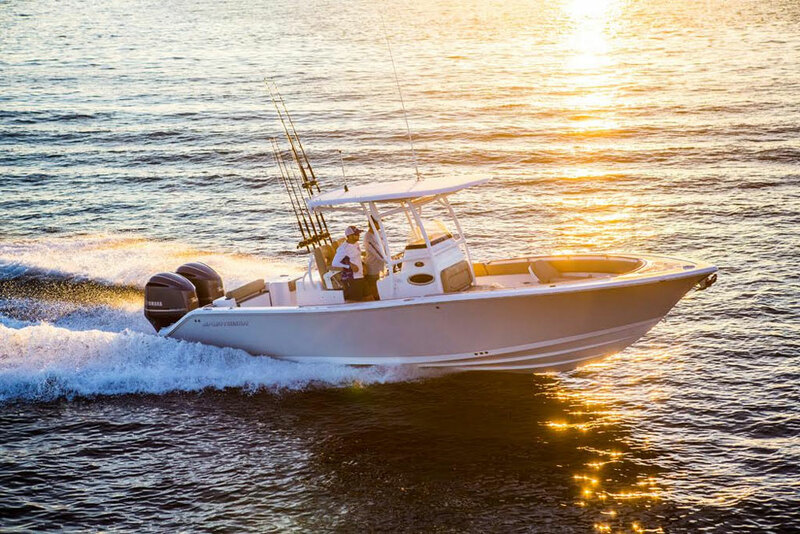 Even though the center console may have been primarily designed as a saltwater fishing boat, it’s copious deck space, sporty performance, and rugged construction make this type of boat great for a huge number of activities. Nowadays, there are a million and one models on the market of all shapes and sizes. But, which ones are the best of the bunch? Here are the 10 best center console boats we’ve seen in the past year or so which deserve special recognition. 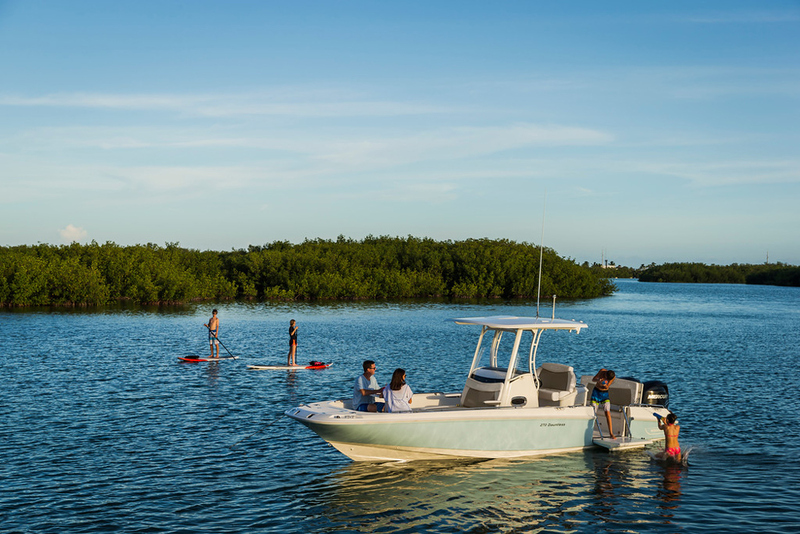 Though small in stature, the Boston Whaler 190 Montauk has a big appeal. Boston Whaler gave the classic 190 Montauk a re-do this year, which quite simply makes it a better boat. First they added an optional teak package, including the swim platform and helm footrest, to give the boat a bit of a nostalgic look. Then they put flanking jump seats in the transom, just forward of flush-mount vertical rodholders that also serve as receiver mounts for the seats’ backrests. The most significant change, however, is found in the foredeck. Whaler managed to design in a relatively large overboard-draining fishbox, without stealing space from the dedicated anchor locker. 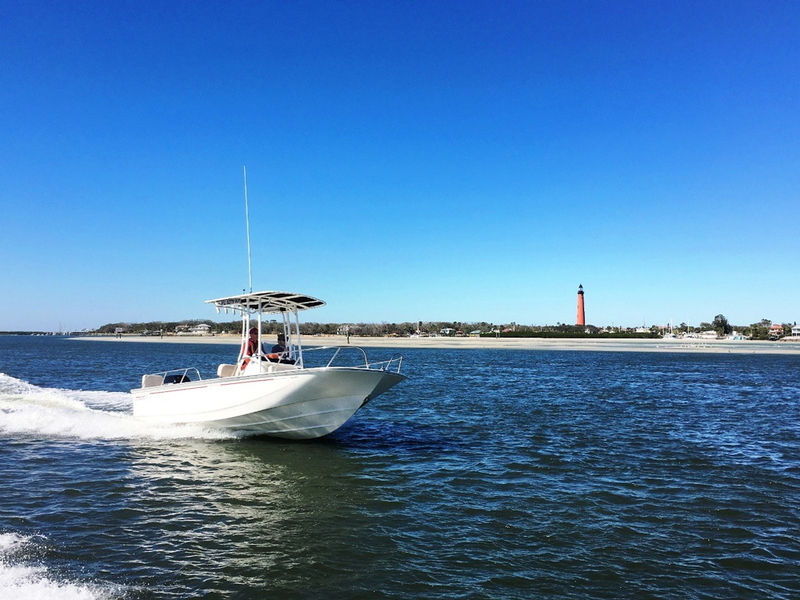 Since this is a classic with some cool new features, it has Boston Whaler’s trademark unsinkable nature, and considering Whaler’s also-epic resale values, there’s no doubt that the 190 Montauk belongs on our list. 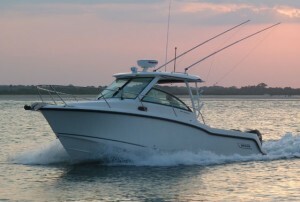 Read the full Boston Whaler 190 Montauk review. See Boston Whaler 190 Montauk listings. 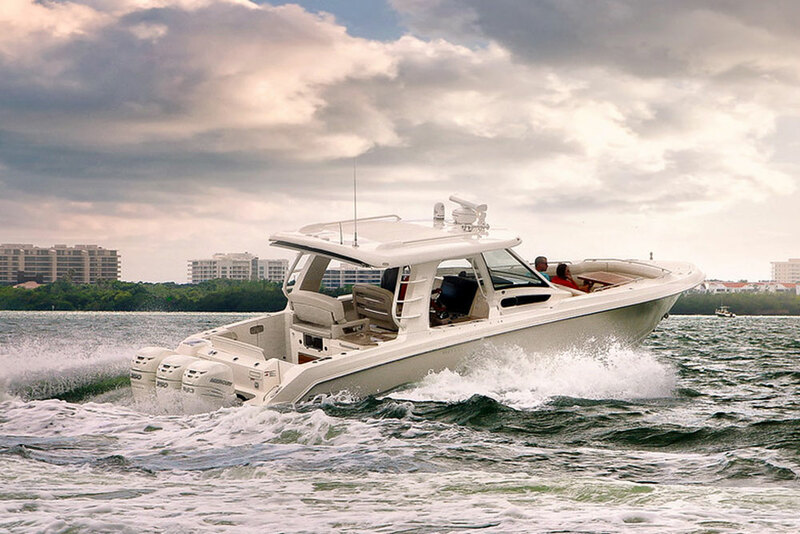 Impressive performance, impressive luxury, and impressive size make the 380 Outrage a winning center console. 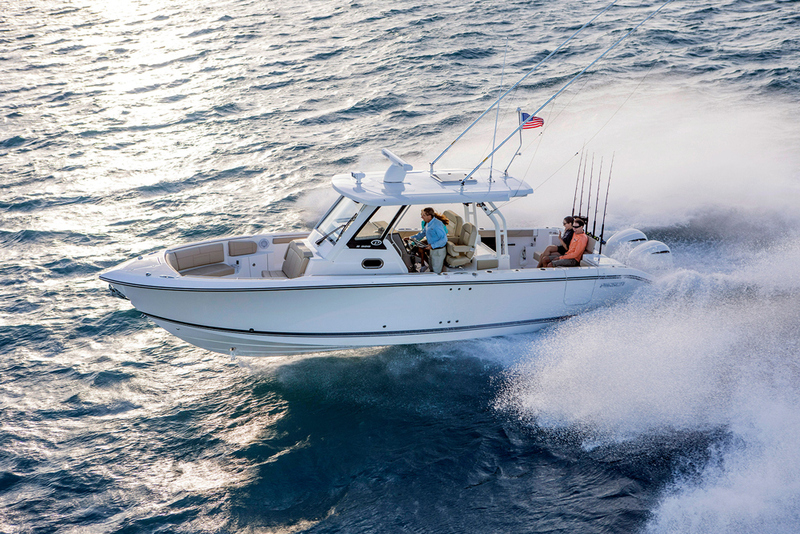 Yes, Boston Whaler managed to secure two spots on our list, but the 380 Outrage is quite a different beast from the 190 Montauk. And we do mean “beast.” This 10-ton, 38-foot-long monster of a center console blasts offshore at speeds up to 50 MPH with triple Mercury Verado 350 HP outboards on the transom. We tested it in the open Atlantic, and it crushed waves underfoot like ripples on a pond. We were also impressed by the boat’s standard equipment list, which includes many big-ticket items – such as air conditioning – that other builders charge extra for. Check out our Boston Whaler 380 Outrage video boat review. 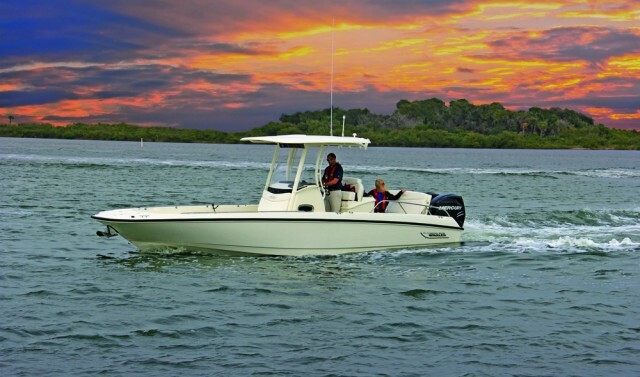 See Boston Whaler 380 Outrage listings. 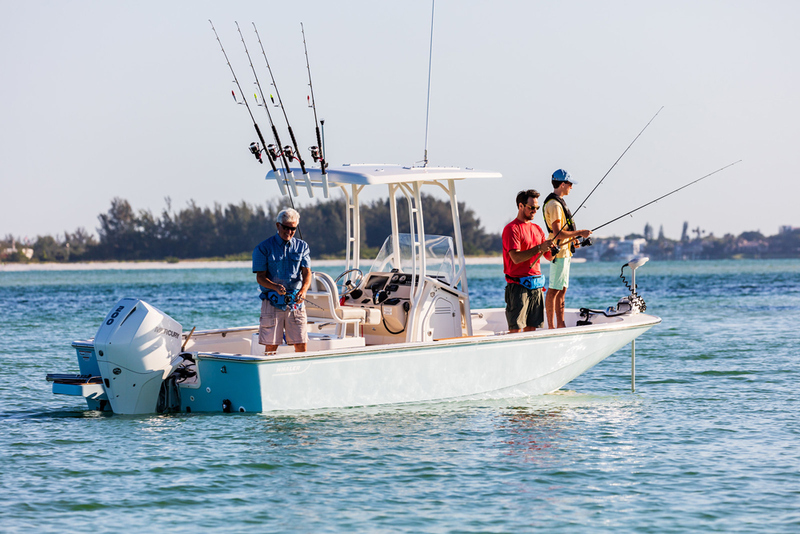 Center console meets bay boat meets offshore fishing machine, in the Everglades 273cc. 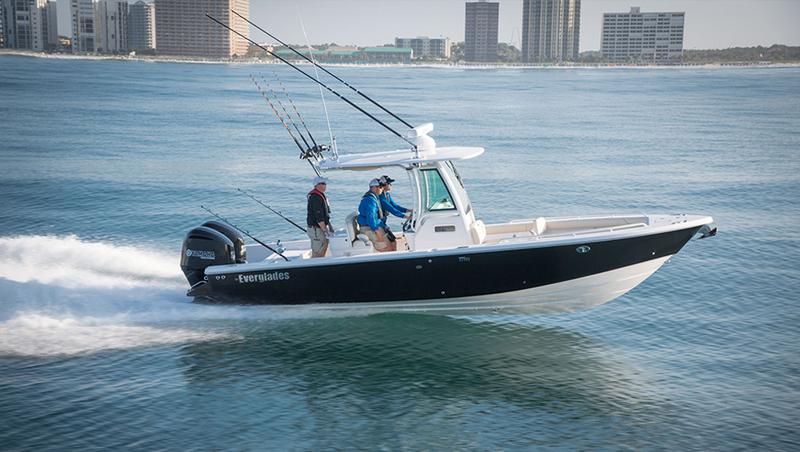 The Everglades 273cc made a cameo in our Best Fishing Boats of 2017 article, and it’s back for more because this center console takes the bay boat concept to a whole new level. 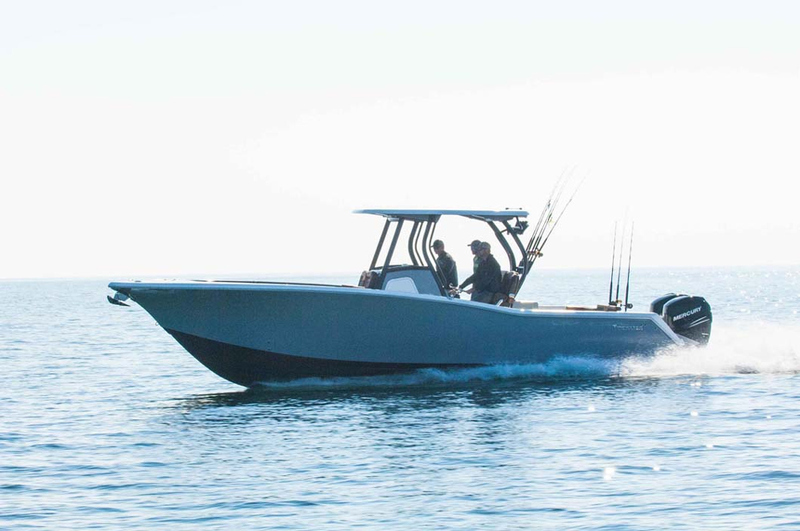 It’s larger than the vast majority of bay boats, thoroughly competent to make long offshore runs as well as fishing inshore, is built with the Everglades RAMCAP molded-foam sandwich construction technique, and runs at speeds into the mid-50s with twin Yamaha V6 F250 outboards. The 273cc also has a significantly steeper deadrise than most bay boats at 20 degrees, and with a 157 gallon fuel tank, this fishing machine has substantially more capability when compared to other center consoles designed for light-tackle fishing. Read the Everglades 273cc review. Is it a center console, or is it a yacht? In the case of the Grady-White Canyon 456, the answer is “yes” in both cases. Grady-White has a well-deserved reputation for building high-quality boats that have excellent resale value, and the Canyon 456 is the biggest Grady-White ever built. It’s even a bit of a stretch to think of this model as a mere center console fishing boat – in truth, it’s a center console yacht. The huge console houses a full cabin with a queen berth, a full galley, and an enclosed stand-up head with shower. A Seakeeper gyro-stabilization system dampens the rocking and rolling. And not two, not three, but four massive Yamaha F350C outboards grace the transom, pushing all 24,500 pounds of this boat up to a cruising speed in the mid-30s and a top-end of 55 MPH. Read our Grady-White Canyon 456 Center Console Review. See Grady-White Canyon 456 listings. Diehard anglers will be interested in the Mako 334 CC. The Mako 334 CC is the oldest “new” model in our round-up, having been introduced two years ago and immediately earning a spot on our Top 10 Fishing Boats of 2016 article. But it still deserves a space in this top 10 list because, quite simply, we haven’t seen anything since that rates bumping it from the list. 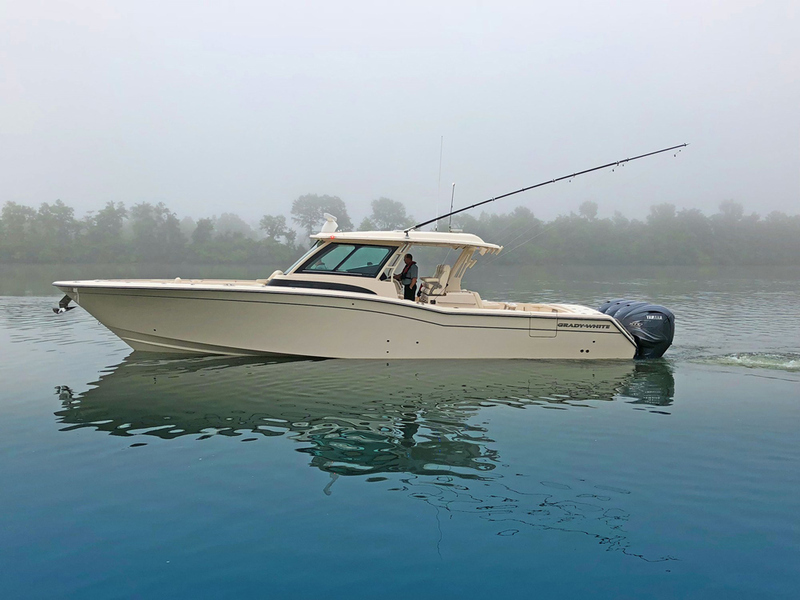 The Mako takes its fishing seriously and unlike many center consoles over 30 feet it isn’t gentrified with gobs of creature comforts, nor does it give up one iota of fishability to make accommodation for other activities. On top of that it’s a serious performer, with a top-end busting through 66 MPH (with triple Mercury Verado 350 HP outboards on the transom). Read the Mako 334 Center Console review. See Mako 334 CC listings. The Mystic M3800 is one example of a non-fishing boat that benefits from the center console design. 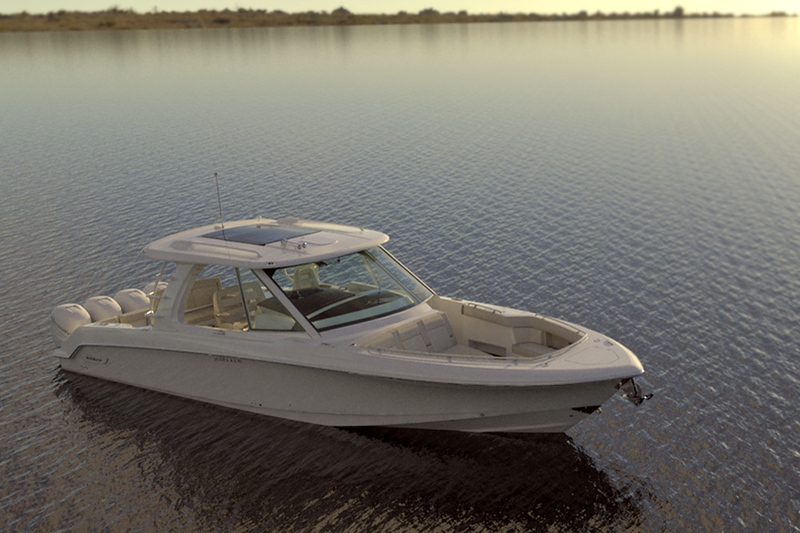 The Mystic M3800 may be a center console, but you’re not likely to spot a fishing rod aboard. This is a speed boat through and through, with a ton of seating for passengers, a huge hard top supported on the sides (instead of the console pipework familiar to fishermen) and a sporty look that says “wanna race?” Construction is unusually high-tech for a center console, too, with vacuum-infused epoxy and carbon fiber reinforcements. And yes, it does blow the doors off all those plodding fishboats – top speed with triple 350s is in the neighborhood of 80 MPH. Read the Mystic M3800 review. 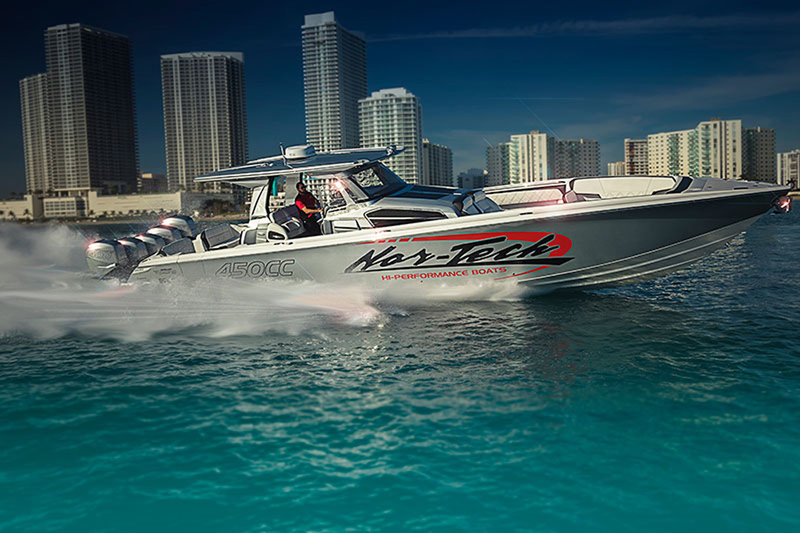 Serious speed and day-boating fun is the concept behind utilizing a center console design in the Nor-Tech 450. Another speed demon in our round-up of top center console boats is the Nor-Tech 450 Sport Center Console. This boat runs on quadruple Mercury Racing 400R outboards, delivering a cruising range in the mid 60s and a top-end in the mid-80s. It’s large enough to support a substantial cabin, has gobs of comfy seating, and is constructed with a fiberglass, Kevlar, and carbon fiber sandwich. It even sports fish boxes and dive tank stowage, so you can enjoy more than merely going fast. Read the Nor-Tech Sport Center Console review. See Nor-Tech 450 Sport Center Console listings. Center consoles don’t have to be rough-and-tumble, as the Pursuit S 328 Sport proves. Few boats do a good job of walking the fine line between fishing machine and family boat, but one that has no problem doing so is the Pursuit S 325. It has wide-open deck spaces, rodholders, a 24 gallon livewell, and integrated fishboxes. But it also sports a console cabin with a berth that converts into a settee, extra passenger seating that flips out of the back of the leaning post and from the transom, an extended swim platform, and a cockpit galley with a sink, refrigerator, and electric grill. Like all Pursuits the fit and finish is nothing short of spectacular – and that’s something everyone will appreciate no matter what type of boating they enjoy the most. 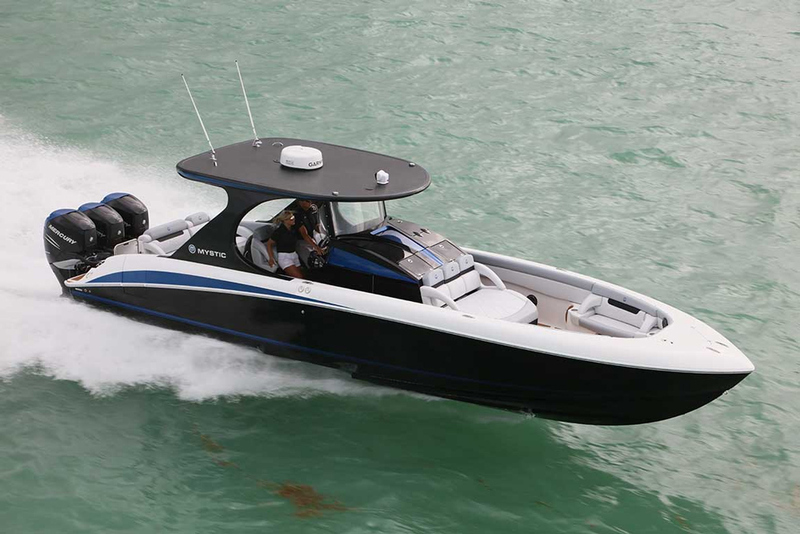 Read the Pursuit S 328 Sport review. See Pursuit S 328 Sport listings. This mid-sized center console has the beef to take on serious seas, and the fishability center console lovers desire. 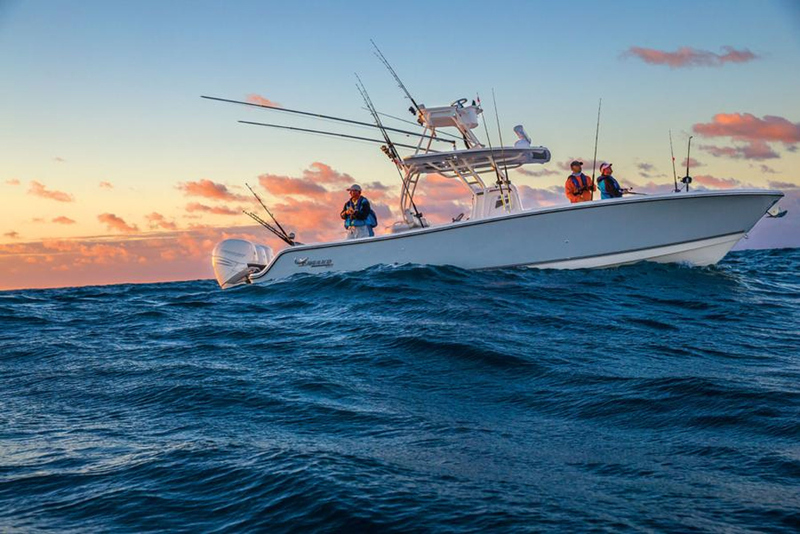 We stepped aboard the Sportsman Open 282 Tournament edition when the wind was howling and the seas were churning (click on the link to our review below, and you’ll see for yourself in the video). In short order, it proved itself worthy of being called a top pick. Not only did the 21-degree deadrise hull do a good job of cleaving open the waves, it also kept the topsides dry. With a pair of Yamaha F200 outboards it hit speeds darn close to 50 MPH and in calmer conditions, there’s no doubt it would surpass that mark. The hull also proved quite efficient, turning in 2.6 MPG at a cruising speed in the mid-20s. Read the Sportsman Open 282 Tournament Edition review. See Sportsman Open 282 Tournament Edition listings. 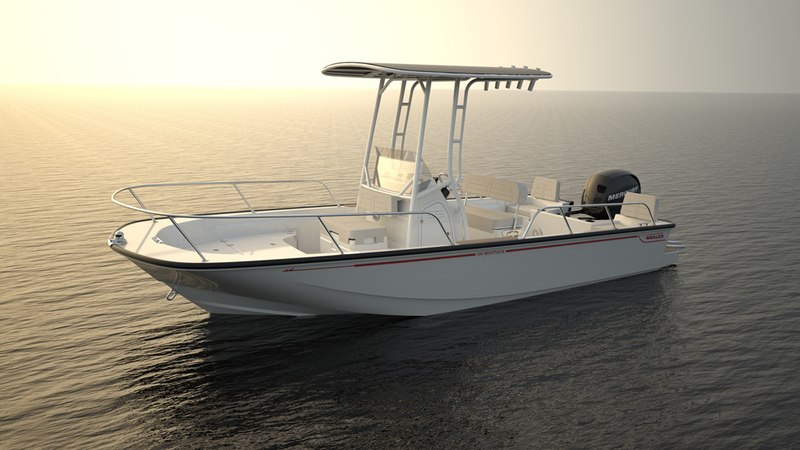 The Tidewater 320 CC Adventure will prove ideal for many fishing families. 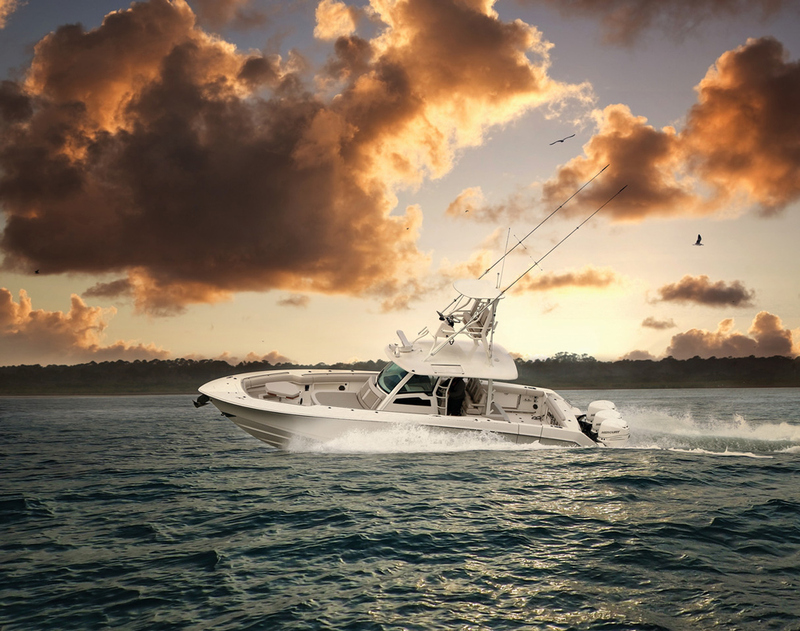 The 320 CC Adventure is the largest boat in Tidewater’s line-up, and like many center consoles this size, it’s set up to do double-duty as both a fishing boat and an entertainer. It has a huge U-shaped bow lounge which converts into a dinette at the press of a button – a table rises right up off the deck. The aft end of the boat is still reliably fishy, however, with perks like a 30 gallon livewell, a rigging station, built-in tackle stowage, and rodholders all around. This is another model our testers rode through choppy seas, and they returned to the dock to give a thumbs-up all around. Top end with a total 700 horsepower on the transom was 59 MPH, and a cruise in the mid-30s is no problem. See the Tidewater 320 CC Adventure review. See Tidewater 320 CC listings.